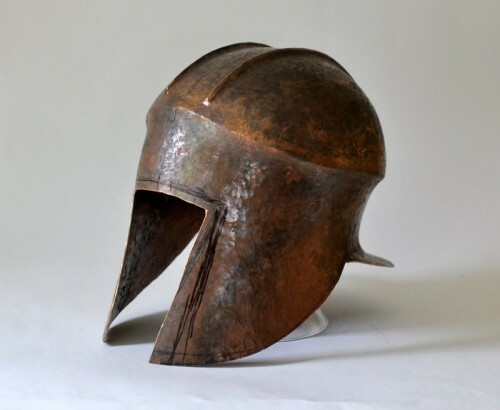 As mentioned in previous posts, tracking down large sheets of armour-appropriate tin-bronze alloys is a difficulty that plagues the ancient-reproductions industry. Unfortunately, this post is not about a universal solution, but at least a small triumph. After that experiment came to a sudden and unprofitable conclusion, I decided to find out more about my cymbals before hitting them. I found out that there are two main types of bronze used in that industry – bell bronze, which has around 20% tin and is so brittle that it can only be formed by casting (which I had discovered the hard way), and malleable bronze which is usually 8% tin and… malleable. 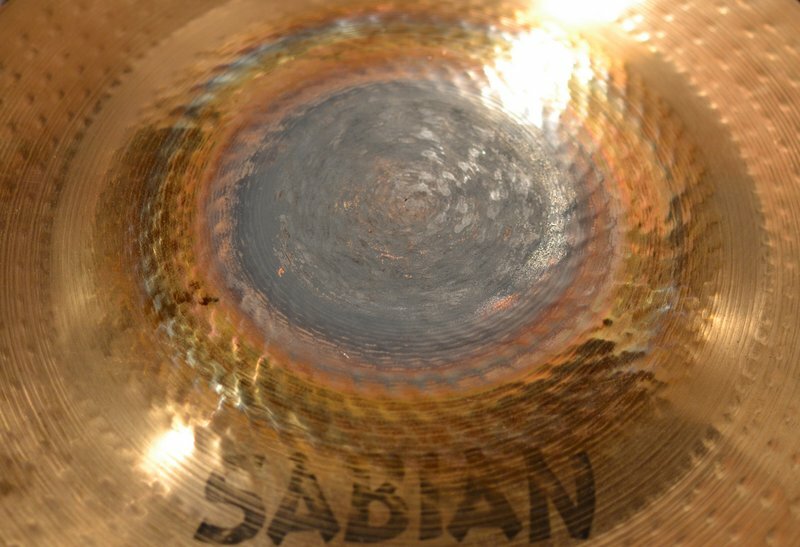 The next cymbal I tried was a “B8 alloy” – a malleable bronze with 8% tin content. After annealing the bronze, I closed the mounting hole by flattening out the bell at the centre of the cymbal. 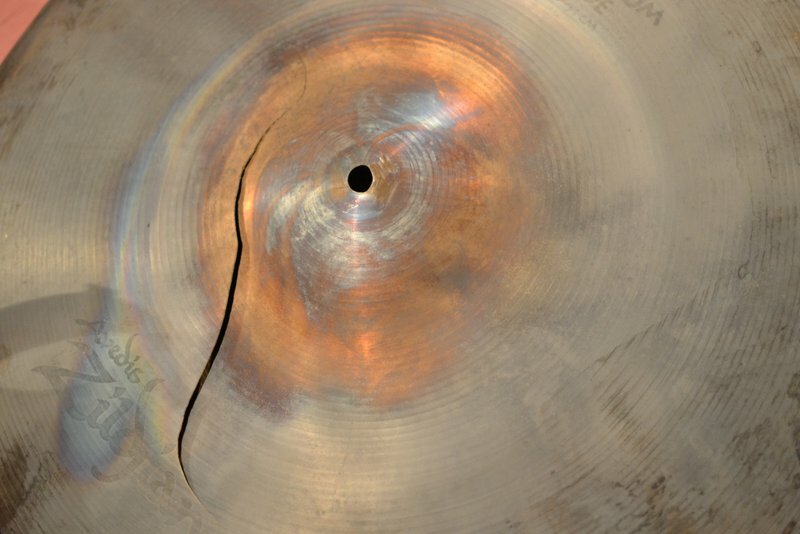 A tiny strip of bronze cut from the edge of the cymbal, a bit of flux and some heat made the hole non-existent. 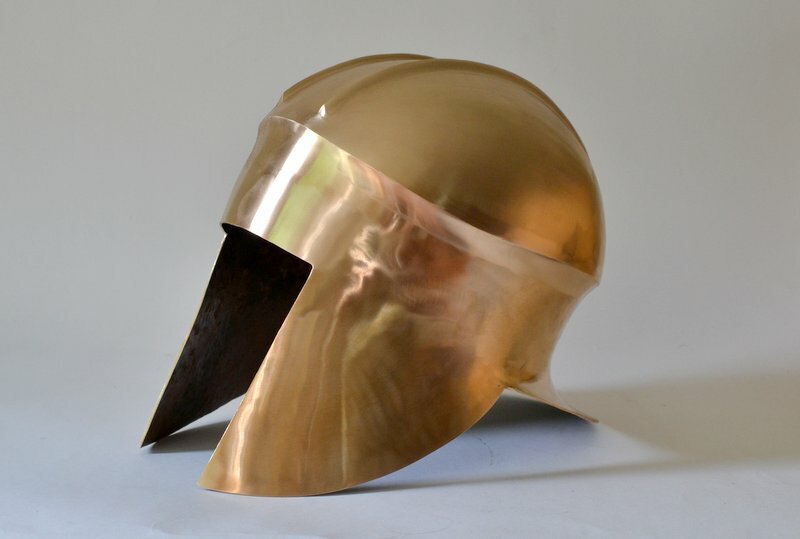 The result was a usable disk of bronze nearly 60cm across – perfect for raising a helmet from! So that is what I did. These photos show how the raising progressed over the course of several days. A few more passes and I began to feel nervous about how much I had trimmed off the side of the cymbal. As the helmet deepened, I roughed out a ridge around the helmet’s brow. The form was getting close enough that I could tell by testing it against my profile template that it would be necessary to draw out some bronze to widen the top of the cheek, where it should meet the nape. The metal had drastically thickened along the lower edge from the compression of the raising process, so it was not difficult to draw out what I needed and still leave the bronze thick enough. After flaring out the nape and forming the crest ridges, I began to roughly trim the helmet to form. 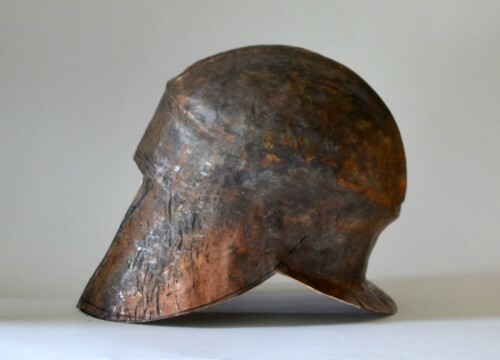 The final trimming waited until the surface of the helmet had been thoroughly planished, which had the effect of simultaneously smoothing and hardening the metal. The face opening was trimmed out – a bit wider than I prefer on an Illyrian helmet, but it was a replica project, so personal preference took a back seat. The next step was to sand the surface smooth through successively finer grits until it was ready for polishing. Here I am about half-way there. After polishing the helmet, I executed a distinctively ancient edge treatment by upsetting the metal around the helmet’s margins. That means I hammered the metal edge-on to compress and mushroom the edge. 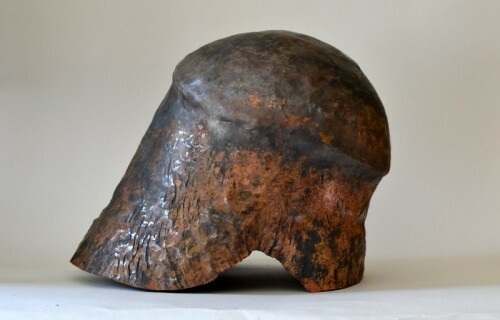 The extra thickness was then moulded, by careful hammering, to a ledge that ran around the helmet’s edge. 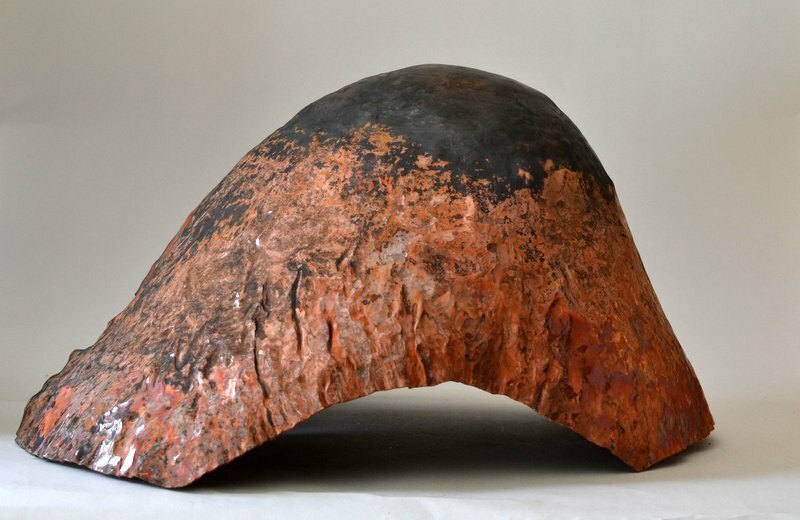 The additional thickness and work-hardening of the edge improved the rigidity of the already hard helmet. The anticlastic form of the nape and cheek guards, the helmet’s distinctive brow ridge and the crest ridges already contributed significantly to the helmet’s ability to resist deformation. These structural features all work toward keeping the weight of the helmet reasonable – mine finished out at just over 1.4kg (3 lbs), which is what the archaeological record had me shooting for. The last step was to make two crests that could be mounted on the helmet. I was requested to avoid light-coloured horse hair, so I made one from hair that I had previously dyed red, using natural dyes, and one from naturally black hair. The finished helmet will be part of an interactive display accompanying an exhibition of artefacts on loan from Greek museums, which will be travelling throughout the USA and Canada. I will post exhibition venues and dates here when I know them. 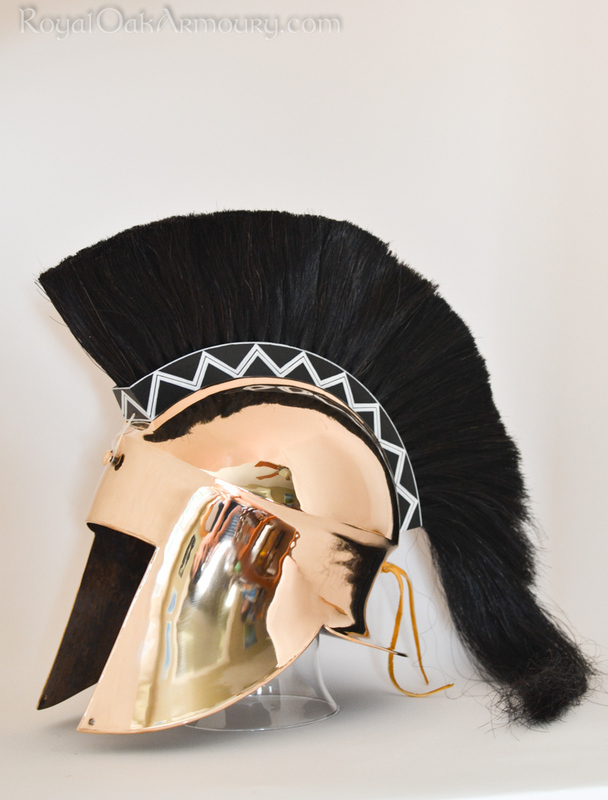 To see more photos of the finished helmet, check our portfolio listing. Please post those dates and venues in case it ends up anywhere in the Pacific Northwest. I’d love to see this in person. 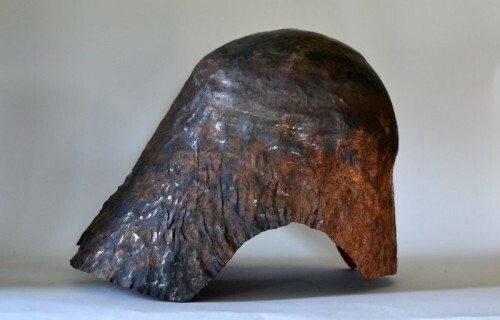 Thank you for sharing the information on the ancient bronze alloy. While, as you said, this isn’t a universal solution, it does point to the important distinction that not all bronze is the same :-/. Tip for the bell bronze: it can be worked, but you have to quench it after annealing. If you anneal it and cool it slowly, it will be as brittle as cast iron. I didn’t know there were cymbals of low tin bronze, I’ll see if I can find some of those for a project I have in mind! P.s. 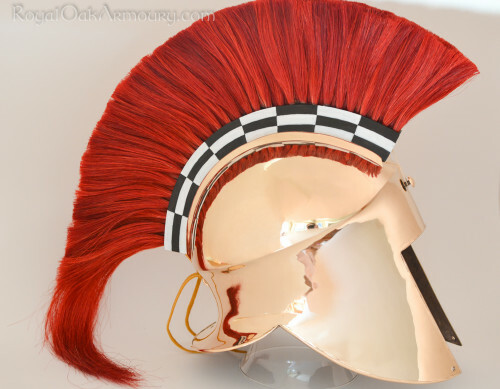 fantastic work on the helmet! Thanks for sharing your expertise, Jeroen! You are right; the catastrophic failure of my first cymbal can only be due to improper annealing. The cymbal was too large to fit in my kiln, and my largest torch could not keep the whole thing at red heat, so that part of it had air cooled before quenching. I have had better results with that alloy in subsequent smaller-scale experiments, but not so great as to give me any hope for the stockpile of bell bronze cymbals I have! From what I have read, bell bronze is a two-phase alloy, which means that any tin in excess of the 15.8% solubility limit will precipitate into a brittle delta-phase microstructure, whether the constituent parts that remain in solution are brought to alpha-phase by quenching promptly after annealing or not. So, it will always tend toward brittleness, even if not so brittle as to shatter at the first blow, as my first experience led me to believe. 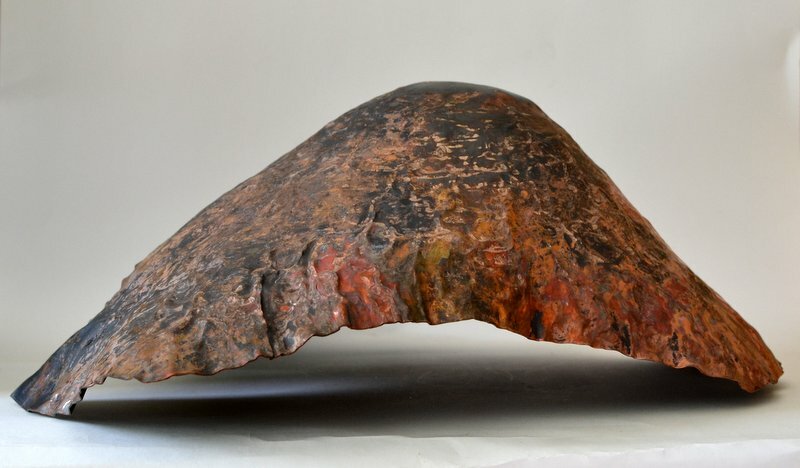 I would love to hear about the project you have in mind for a malleable bronze cymbal! The bell bronze can also be worked hot to some extend, roughly between 600-800C. But I wouldn’t actually forge it at that temperature. I’ve had some experience with this alloy in reproducing Chinese bronzes. After I found that the casts were extremely brittle, I looked on the internet, and actually found the answer to anneal and quench them from cymbal makers 🙂 I’m currently just looking to find a cheap source of bronze sheet, so beat up cymbals could be an idea. Cymbals are pretty close to shields, so that might be a purpose. Fantastic work. I read somewhere, a long time ago, that some Ancient Greek helmets were produced from a cast blank thinned by beating to improve the hardness. It so happens that I have a reasonably simple system for casting same and would happy to send you a sample or two for you to try. I have some 88:10:2 alloy which might be a good start. We know the weight but what shape would be a good starter? The blank would require annealing many times during thinning, so I don’t think that a harder helmet was the goal of starting thick. I think that the blank would be cast as thin as possible, but I am under the impression that anything under about 4 mm was difficult to cast without excessive amounts of lead, so thinning the blank by hammering was necessary. I would love to try my hand at making a helmet from a cast bank! I think a round disk cast as thin as possible would be an ideal place to start. 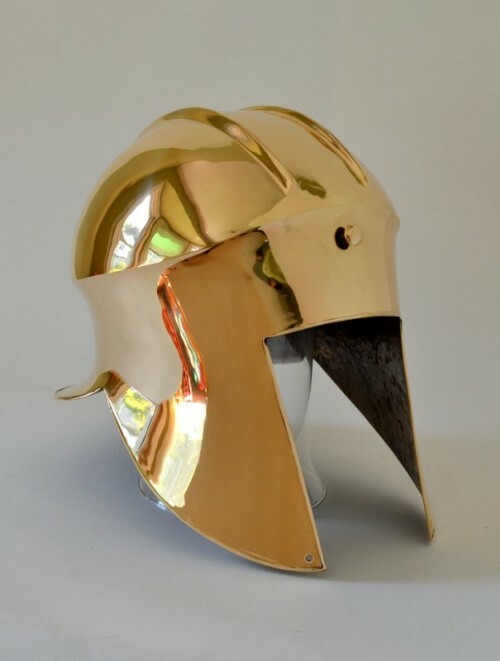 Attempting a Corinthian helmet with a thicker area intended to become the nasal would be an interesting subsequent experiment. I will be in touch. Thanks for your offer! Gorgeous! Did you continue planishing after the rough picture before you started sanding? I don’t think so; I think I headed right into grinding at that point.